For a weekend loaded with great food, great wine and true relaxation, there&apos;s no better place than Carmel Valley. Carmel Valley is a prime destination for foodies and wine lovers. CV Village (as the locals refer to it), with its bucolic crossroads, has enough wine tasting rooms for a fantastic wine country vacation. For a true farm-to-table experience, epicureans can tour the legendary Earthbound Farm and then dine on locally grown produce at a number of Carmel Valley&apos;s regionally focused restaurants. A horseback ride through a historic ranch not only works off the calories but also allows visitors to get in touch with Carmel Valley&apos;s ranching history. Arrive early in the afternoon and check in at a tucked-away lodge that feels like your own private hideaway. The Country Garden Inns are ideally located within walking distance of Carmel Valley Village and are known for their tasty breakfast buffet. Stonepine Estate, on the list of Historic Hotels of America, offers the ultimate in luxury and privacy. Dog-lovers will find their pets are as pampered as the humans at Carmel Valley Lodge. If you&apos;re looking for the pleasures of a lodge getaway on a limited budget, the Blue Sky Lodge offers a restful and relaxing atmosphere. 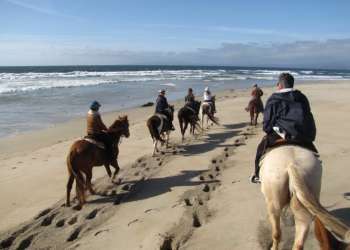 Start your Carmel Valley experience with a horseback ride at a historic ranch. The property on which Holman Ranch resides was the site of the first private rancho in Carmel Valley. In the late 1920s, it became a hideaway for Hollywood stars. Now it hosts private events, houses an equestrian center and offers trail rides with breathtaking views of Carmel Valley. While you&apos;re riding, you may catch a glimpse of Holman Ranch&apos;s olive trees, pinot vineyards and cattle roaming the range. The restaurant at Carmel Valley Ranch is simply known as "The Dining Room." It offers French cuisine with a California twist that highlights locally grown ingredients, and is the perfect spot for a memorable dinner. Watch local golfers on their Saturday outings over breakfast at Edgar&apos;s at the Quail Lodge Golf Club. Make sure to get an outside table so you can admire great views of Carmel Valley while eating locally oriented meals like the Monterey Benedict, which features dungeness crab and artichokes. It may be hard to believe, but the world&apos;s largest grower of organic produce started here! Earthbound Farm may have expanded, but their research and development farm is still located right at the edge of Carmel Valley. Take a tour of the Walking Labyrinth, visit the Cut-Your-Own Herb Garden and stop by the farm stand to buy local, organic produce to take home. The Rio Grill has been a favorite among local residents for over 25 years, but don&apos;t think for a minute that means it&apos;s stuck in the past. The restaurant constantly spices up its menu with new selections, while keeping old favorites in place for fans to enjoy. Rio Grill is located near the first tasting room on your wine journey, Taste Morgan. Pace yourself, however, because there&apos;s many more to try! On your way back to Carmel Valley Village there are several other tasting rooms, such as Bernardus Winery, Cima Collina and Joullian Vineyards are located. Be sure to take your time! When you walk into the Restaurant at Los Laureles Lodge, don&apos;t be surprised if the bartender seems to know nearly everyone who walks through the door. This restaurant, located in Muriel Vanderbilt&apos;s former home, is popular among locals for its great food and old-time atmosphere. Head over to the saloon after dinner for live music. You may find yourself rubbing elbows with a local rancher, farmer or winemaker. After a relaxing morning sleeping in, awaken with a delicious breakfast at Bernardus Lodge&apos;s Wickets Bistro. Don&apos;t count calories -- the breads, pastries and muffins from the on-site pastry chef are a taste sensation. Many of the ingredients in your organic tomato Bloody Mary or lobster eggs Benedict are locally sourced; in fact, some of the produce is grown at Bernardus&apos; very own organic gardens. Sit outside and enjoy Carmel Valley&apos;s sun and the Euro bistro ambience, or play a round of bocce or croquet before your next appointment. Need just one more push to land in a state of perfect relaxation? The Spa at Bernardus Lodge will ensure that any last bits of tension will leave your body. Much like Carmel Valley&apos;s restaurants, the treatments at Bernardus Spa use ingredients sourced from their vineyards, their gardens and the nearby ocean, including grape seed exfoliation, massages with organic lavender oil, sea baths and more. You&apos;ll be floating in a state of bliss on the way home - or perhaps you&apos;ll want to stop at Wickets to enjoy the view and a final glass of wine and make your weekend last just a little longer.